At the Cardiovascular institute of Los Robles Hospital & Medical Center we have developed a heart program focused on your individual needs. As medical technology improves each year so do we. From quality clinical care to state-of-the-art equipment, our heart surgeons are committed to our role as leaders in cardiac and cardiovascular care. We specialize in interventional cardiology, cardiovascular surgery, thoracic surgery, non-invasive cardiology, chest pain and emergency care. 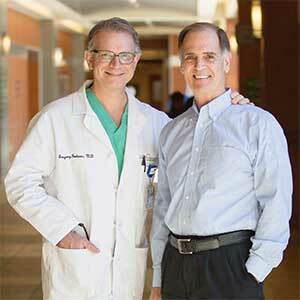 We are the premier comprehensive cardiovascular and thoracic surgery program in Ventura County and San Fernando Valley, complete with Allied Health Professionals. In addition, the cardiac surgery team at Los Robles Hospital consists of surgeons, nurses, rehabilitation therapists, case managers and ancillary staff members who have dedicated their careers to the care and treatment of heart patients. You or your loved one will receive 1:1 nursing care for up to 24 hours while in the cardiac ICU. We are available for consultation for high-risk patients and second opinions. We are also happy to take time to talk with patients to be a part of the education process. Contact our office if you have questions about our services or need to setup an appointment with one of our surgeons.